Phone pairing a snap in all-new VW Jetta. At just under $28,000, our SEL Premium grade is chock full of class-above features and, further pleasing our judges, features that work well. The ’19 Volkswagen Jetta is the lowest-priced entrant on this year’s Wards 10 Best UX list, but it dazzles our judges with features not normally found in mass-market compact cars. At just under $28,000 – about $8,000 less than the average transaction price of a new vehicle in the U.S. this year – our SEL Premium grade is chock full of class-above features. The Jetta scores strong upon entry, with many judges surprised and delighted by its simple and stylish Germanic design, 10-color ambient lighting, ventilated seats (handy for sticky mid-July weather) and a 10.25-in. (26-cm) Digital Cockpit LCD gauge cluster. The virtual cluster’s tachometer and speedometer (i.e. Classic View) are beautifully rendered, while the information display between them is easily cycled through via an attractive metal-finish tab on the steering wheel. 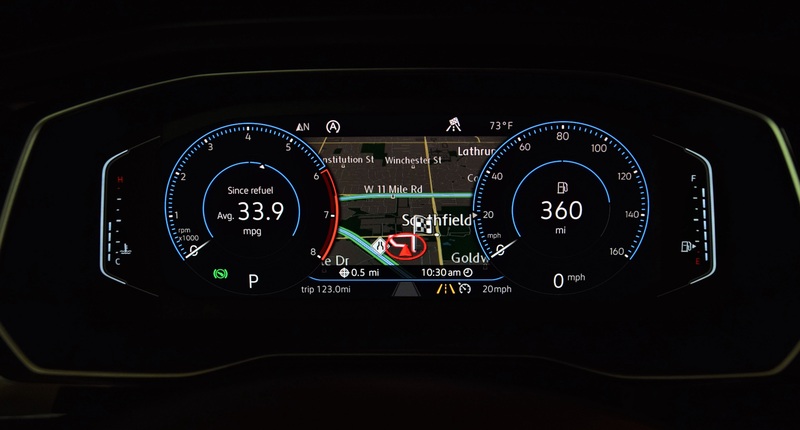 Straight out of higher-priced models by sister brands Audi and Porsche, the Digital Cockpit cluster allows the driver to toggle between full or partial-screen map or gauge displays – or a combination of the two – by hitting the “View” button on the steering wheel. The cluster screen is subtly curved for dramatic effect. Like the cluster screen, the car’s 8-in. (20-cm) touchscreen, shared with the Atlas large CUV, has crisp, clear fonts; bright, colorful details (the SiriusXM station logos are especially vibrant); and large virtual buttons making selections easy while the car is in motion. The screen’s capacitive-touch sensor requires just gentle pressure from a finger tap. Jetta's Digital Cockpit cluster in action. “Bright, beautiful and packed with information, without being overwhelming,” decrees judge Tom Murphy of the Jetta’s displays. Pairing phones is no problem, nor is using the Jetta’s standard Apple CarPlay, part of the standard App-Connect suite that also includes Android Auto. Voice commands work well, with phone calls and SiriusXM station tuning (ex. “Channel Classic Rewind”) completed quickly and accurately. Maps easily zoom in and out via the tune knob, and map view can be changed between 2D and 3D without having to dive into sub menus, thanks to a virtual button at the bottom of the map screen. Buyers of the SEL and SEL Premium grades can access the Car-Net Security and Service plan, which has smartphone and smartwatch apps to remotely control various vehicle functions. Our Jetta came with a healthy dose of driver-assistance technology. Adaptive cruise control, lane-keeping assist, rear cross-traffic alert with braking, forward-collision warning, automatic emergency braking and blindspot monitoring all are present. Yours truly used ACC on Detroit’s Woodward Ave. for about 5 miles (8 km) without once touching the brake or accelerator, as the car, never losing sight of the vehicle ahead, comes to a smooth stop at lights behind other vehicles. It accelerates confidently, not scarily, with a tap of the wheel’s resume button. All ADAS functions can be turned on or off. All this, together with a sonically stupendous 400-watt, nine-speaker BeatsAudio system and VW’s typically high-quality interior materials (soft-touch upper IP with stitching, circular-knit headliner, decorative “dashed” lower door trim that blends seamlessly into speaker grates) make the Jetta a deserving winner of a 2018 Wards 10 Best UX award. “It’s great to see VW putting a quality compact car on the market that is competitively priced, with modern technologies contributing to a first-rate user experience,” says Murphy.